Don&apos;t let you and your family go without hot water for too long. 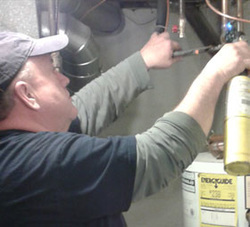 With over 35 years of experience, we&apos;ll quickly have your water heater fixed or replaced. Call today to schedule your repairs. We offer same-day service. We repair commercial and residential water heaters. These would include gas, electric, propane, and tankless water heaters. You can get a DISCOUNT if you&apos;re a senior citizen or military veteran. Trust us with your water heater repairs.